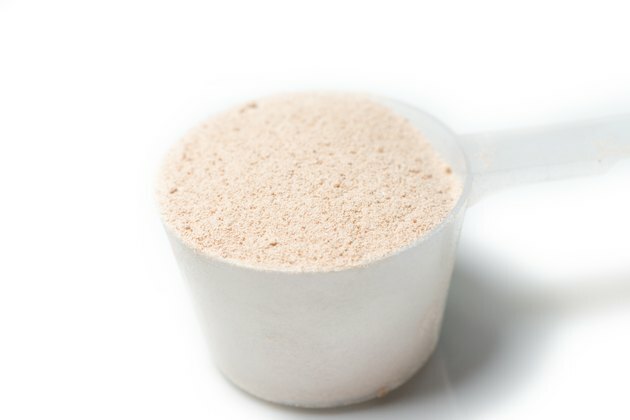 Using protein powder for weight loss can be an effective tool to help you reach your goal, but it isn't a magic bullet when it comes to trimming pounds. You can use it to support muscle repair after a hard workout and to boost your protein intake when you just can't get enough from whole-food sources. Adding protein powder to your diet without cutting calories will not help you lose significant weight, though. You must use it as part of an overall low-calorie plan, along with exercise, to get weight-loss results. Protein powders come from a variety of sources, including whey, soy, brown rice, peas, egg white and hemp. The type you choose depends on your personal preferences. Choosing one source of nutrition drink over another may not make a difference in your weight management goals. Researchers at McMaster University investigated the effect of whey and soy supplements on protein synthesis during weight loss. The findings, published on Examine.com in 2018, concluded that whey protein was absorbed more quickly than soy protein, but there was no significant difference in body composition between the soy and whey groups. The study showed no proof that whey is better for maintaining lean mass during weight loss. Whey protein helps to drive muscle anabolism, or growth, notes a meta-analysis published in the 2013 issue of Nutrition and Metabolism. When dieters trim calories, the body often burns valuable lean muscle mass for energy. The growth-inducing qualities of whey help to spare muscle loss when you decrease calories to lose weight so you lose more fat. Casein seems to have the same effect, and researchers aren't sure which is superior, so you might get benefits by combining them. Milk proteins also help to control hunger, which makes sticking to a low-calorie diet easier. Brown rice protein is a superb plant source of amino acids and provides a good protein alternative if you're lactose intolerant. A 2013 issue of Nutrition Journal tested the muscle-sparing effects of whey protein vs. rice protein consumed after exercise training three times per week for eight weeks and found that both types had similar effects on muscle recovery and improvements in the ratio of lean body mass to fat. Read More: What Are the Benefits of a Protein Shake? Lean meat, egg whites or white-meat poultry are examples of whole-food proteins that contain nutrients in addition to protein. When you have a choice, opt for whole-food protein because it's essential for satiety, a healthy body and weight loss. Protein powder drinks or protein shakes do serve as a quick way to fit this nutrient into your diet when you don't have time or access to whole foods, such as on a busy morning or immediately after a workout. Replacing a high-calorie breakfast with a protein shake is one way to use it for weight loss. You may also blend the powder into milk or water for a convenient and easily digested post-workout snack. The protein ingested after working out helps your muscles repair more quickly, meaning you can hit the gym again sooner to burn more calories. If you're not exercising, mix protein powder into water or milk for the occasional afternoon snack that will help to suppress your appetite and keep you away from your office mate's candy bowl or the vending machine. Protein powder could undermine your weight-loss efforts if you mix it into a high-calorie shake or smoothie. Add yogurt, juice, banana, honey and other fruit, and suddenly your sensible snack has more calories and sugar than some meals. Mix the powder into low-fat milk or water when you use it as a snack. If you're using it as a meal replacement, add just 1/2 to 1 cup of fruit and 1/2 cup of skim milk. This helps to keep the calories in check. Avoid protein powders that contain extra carbohydrates, especially in the form of sugar. Natural flavorings, such as chocolate or berry, usually don't increase the powder's calorie content and make it more palatable. Be wary of protein powders that contain extra supplements, as these aren't well-regulated by the U.S. Food and Drug Administration. Check with your doctor before adding protein powder to your diet if you're under medical supervision for a specific health condition or on medication that requires you to monitor your protein intake. For most people, barring any allergies to ingredients in a protein powder, a daily serving is perfectly safe. Some protein powders contain contaminants, such as arsenic, cadmium, mercury and lead, which can have a toxic effect on your body if consumed in large quantities. Clean Label Project Protein Powder Study 2018 tested 134 protein powders and drinks and found all of them contained detectable amounts of at least one heavy metal. Overall, products made from soy fared worse than those made from whey, with an average of twice as much lead and other contaminants. If you're wondering when the best time to take your protein supplement for weight management is, evidence shows that taking your supplement between meals may make it less effective. A review of 34 studies, published in Nutrition Reviews, concluded that consuming protein supplements with meals, resulted in weight loss. Results showed that taking protein supplements between meals promoted a weight gain. So if your goal is to gain weight you should take your protein supplements between meals. Examine.com: Whey vs. Soy Protein: Which Is Better When Losing Weight? Can You Lose Weight Drinking Protein Shakes to Replace 2 Meals a Day? Is Syntha-6 Good for Weight Loss?